We’re into a new month now, so it’s time once again to dive into the MLB Trade Rumors archives. This series is intended to inform and entertain, not rip on folks for bad rumors or silly ideas. We’ve all had dumb baseball ideas. May is usually when we start to hear about trade deadline shopping lists and thinks like that. The summer trade season is still a few weeks away though. It doesn’t heat up until after the June amateur draft, typically. Improbably, the Yankees went 16-10 in April 2013 and were only two games back of first place at the end of the month. They did that despite injuries to Alex Rodriguez, Derek Jeter, Curtis Granderson, and Mark Teixeira. It was a patchwork lineup early in the season — and, as we know now, a patchwork lineup all season — but it was working. That didn’t stop Brian Cashman from looking for upgrades though. Let’s get to the May 2013 rumors. Yankees right-hander Chien-Ming Wang has agreed to remain with the Yankees organization rather than exercise the first opt-out clause in his minor league contract, according to a report from Focus Taiwan (via Mike Axisa of River Ave. Blues). Wang looked pretty good during the World Baseball Classic, so the Yankees signed him for pitching depth, and to see whether he truly had anything left. He made three starts with Triple-A Scranton in April and allowed four runs (two earned) in 19 innings. Wang threw seven innings of one-run ball in his final start before the May 1st opt out and I remember a mini-freakout over whether the Yankees would let him go. He chose to stay with the Yankees, saying he felt he needed more time in the minors before returning to the show. Wang 2.0 never did happen. The Yankees didn’t call him up later in the year. With Kevin Youkilis sidelined with a lumbar spine sprain, the Yankees are asking around about right-handed hitters, according to Danny Knobler of CBSSports.com (on Twitter). Understudy Jayson Nix will take over at third base in the interim with rookie Corban Joseph called up in support, but the Bombers will also look out-of-house for reinforcements. Oy vey. Wells had a good April and that was it. 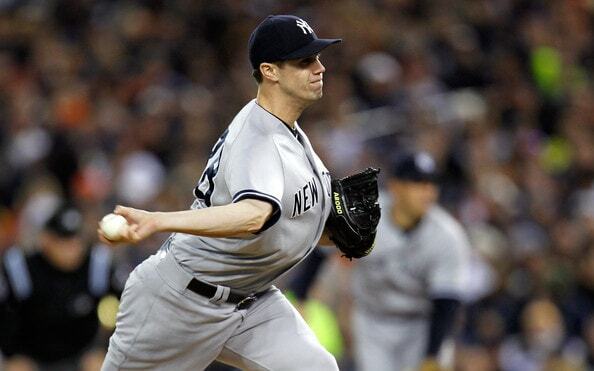 Aside from that, the Yankees had zero right-handed thump for the first few months of 2013. It wasn’t until A-Rod returned and the Alfonso Soriano trade went down that the Yankees weren’t so lefty reliant. The Yankees announced that they have acquired infielder Chris Nelson for cash considerations or a player to be named later. The Bombers moved Francisco Cervelli to the 60-day disabled list in order to make room on the 40-man roster for their newest acquisition. Nelson’s career with the Yankees somehow consisted of ten games and 37 plate appearances. That seems like too much. Nelson went 8-for-36 (.222) during his two weeks in pinstripes before being dumped for the next infield flavor of the week. The Yankees have designated right-hander Cody Eppley for assignment, according to Mark Feinsand of the New York Daily News (on Twitter). The move clears a 40-man roster spot for fellow right-hander Preston Claiborne. In a related move, Joba Chamberlain was placed on the disabled list. Cody Eppley! He spent most of 2012 in the bullpen, throwing 46 innings with a 3.33 ERA (3.66 FIP) and a 60.3% strikeout rate. In 2013, he allowed four runs in 1.2 innings, and was out of the organization by June. Eppley’s been bouncing around independent leagues since 2014. Last year he had a 2.43 ERA and 32 saves for the Southern Maryland Blue Crabs in the Atlantic League. Middle relievers, man. They go from useful to useless in a hurry. That also applies to Claiborne, who went from potential keeper to castoff just as quickly as Eppley. Claiborne at least reached the big leagues again — he appeared in a game for the Rangers last summer. The Yankees have acquired minor league shortstop Alberto Gonzalez from the Cubs in exchange for a player to be named later or cash, tweets Andy McCullough of the Star-Ledger. Gonzalez, who first appeared in the big leagues with the Yankees back in 2007, has seen limited MLB action over the last two years for Texas and Chicago. Over 989 career plate appearances, he has a .241/.279/.319 line. Remember when Gonzalez was a young up-and-coming infielder the Yankees acquired from the Diamondbacks in the Randy Johnson trade? He’s 35 now. Gonzalez appeared in 13 games with the Yankees during that 2013 season and that was it. He hasn’t returned to the big leagues since. Gonzalez hit .251/.315/.301 in 50 winter ball games in Venezuela this offseason though, so he’s still kicking around. The Yankees went through so many spare part infielders during that 2013 season. Good gravy. The Cano update here was one of those “Hal Steinbrenner said the two sides are talking” non-updates. The more interesting nugget is this blurb on Granderson changing positions. That was a hot topic back in the day. Granderson was a good center fielder, but Brett Gardner was better, and the Yankees were considering flipping the two so Gardner could play center. They did it too. Granderson played 25 games in center, 14 in right, and 13 in left around injuries that year. If not for the injuries, I think Gardner in center and Granderson in a corner would’ve been a permanent arrangement. The Rockies have traded utility infielder Reid Brignac to the Yankees, tweets Jon Heyman of CBSSports.com. Heyman adds (via Twitter) that the Rockies will receive $75,000 cash in the deal. Brignac was designated for assignment by the Rockies on Thursday. Another spare part infielder. Brignac lasted 17 games with the Yankees, going 5-for-44 (.114) overall. He bounced around from team to team for a few years after that and is currently hitting .286/.322/.393 for the New Britain Bees of the independent Atlantic League. The Yankees have signed third baseman Josh Bell to a minor-league deal, Chris Cotillo of CLNSRadio.com reports. Bell has hit .195/.223/.265 in 272 career big-league at bats. He received 55 at bats for the White Sox’s Triple-A affiliate in Charlotte in 2013 before being released. I forgot about the other Josh Bell. This isn’t the current Pirates first baseman. This is the former Orioles prospect. Bell never did play for the Yankees. He spent about a month with Triple-A Scranton, hit .205/.329/.361, then was cut loose. Bell has since played in Korea, Mexico, and the Dominican Republic. He hit .247/.354/.426 for the independent Lancaster Barnstormers last season. No surprise the Yankees missed the postseason in 2013 when so many dudes they acquired during the summer wound up in indy leagues. The Yankees announced that they have claimed David Huff off of waivers. To make room on the roster, the club designated Francisco Rondon for assignment. The first of two stints in pinstripes for Huff. He actually made two September starts in 2013, including the token “let’s just get this over with” Game 162 start. Huff allowed 23 runs in 37.2 innings for the Yankees that year. He bounced around for a few years before going to Korea and becoming one of the best pitchers in the league, throwing 199.1 innings with a 2.66 ERA from 2016-17. Huff has a 5.93 ERA in 30.1 innings for the Yakult Swallows in Japan this season. Never too hard to find work if you’re left-handed, eh? The Yankees have designated Ben Francisco for assignment, according to Mark Feinsand of the New York Daily News (via Twitter). The move will create room for the newly-acquired David Huff on the roster. That’s Opening Day designated hitter Ben Francisco to you. Gosh, he was so bad that year. Francisco hit .114/.220/.182 (14 wRC+) overall and .088/.225/.176 (1 wRC+) against lefties. That’s literally the only reason the Yankees signed him. To hit lefties. Francisco never returned to the big leagues after the Yankees cut him loose. He’s been out of baseball completely since 2015. The 2013 Yankees, man.